Bring people together by expressing a clear call toward shared purpose, tuned to getting the right people into the room with shared intent. Let people know why this is important and what to expect, while requesting the honour of their presence. We may not perceive an option or possible action until someone or something draws our attention to it and beckons. This gives us permission. When a person says they are responding to a calling, that implies they are experiencing some form of invitation. An invitation is especially attractive when it is timely and personalized. Elements 2-4 delineate the Theme or Big Question, which is summarized in the invitation's title, not more than 6 words long; see more below. The Theme should make it clear that the objective is to explore, not to solve a specific problem. Context: Invitation is important to: (a) elicit, engage and align the passion of a group, (b) ensure the right people cannot resist showing up and participating fully and generously, and (c) create a sense of shared urgency and shared purpose for the group. 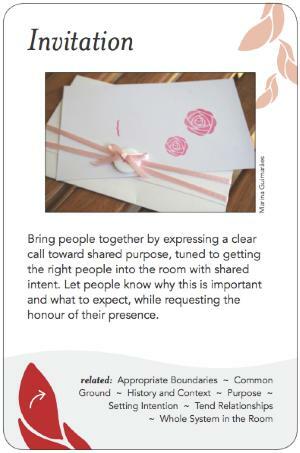 Instructions: A suggested framework for an Invitation is shown in the Heart space above. Short. Anything more than a half dozen words is usually too long. Always stated as a question. Questions open space. Statements close it. Stated in the language of the people. Every organization or group of people has its own special language and code words. The theme should be stated in that language/words. This is one reason why a great theme for one group will automatically be a dud for another. Cuts to the heart of the matter. There is a place for diplomatic statement, but it's not here. Verbal obfuscation rarely arouses passion -- and you want a lot of passion. A really good theme will be so specific to that group that others will simply not notice it - or if they do notice, then not be inspired by it. Who is the invitation going out to? Is an invitation "pass-onable" appropriately, or should the convenor's permission be asked first? Sometimes you only want to hold an event when certain people are all willing to come, in which case if your "irresistable" invitation is resisted, Invitation can include conversation or other strategies beyond a written invitation to connect with them about their participating. Allow enough time for invitees to clear their calendar to attend, and be prepared for any number of invitees to show up.